I admit it. I rudely interrupted my mom’s turkey dinner by being born on Thanksgiving during our family’s first ever Thanksgiving Goodstein Family Reunion. So many other babies followed this debut that our family has ballooned exponentially, and these days, between 90 and 130 Goodsteins from all over the world show up in one place every Thanksgiving to tell each other our best stories, take each other’s pictures, eat some food, preferably fattening, look at pictures of our own selves, eat again, play every conceivable kind of live music, perform bogus magic tricks in costume, eat dessert, and present plays and puppet shows and displays of acrobatic prowess. This is no great surprise, actually, considering that we’re descended from a long line of artists, musicians, actors, dancers, and shameless hams. One story told how my grandfather and a lot of other young men were abducted by the Cossack army during WW I, and they had to march on foot all the way from Poland to Manchuria eating only dry bread and sausages. My grandfather soon became a legend because he could ride on horseback at full speed while standing on his hands. The men had to ford all the rivers naked with their clothes and rifles on top of their heads and everyone got frostbite on their feet and their toenails fell off. Another story told about a ship that sunk on its way to America and explained exactly how our feisty blond matriarch fought to stay with her own new husband in one of the few lifeboats. A Holocaust survivor wrote a riveting description of her years in Auschwitz as a young teenager. She told how she considered the number on her arm to be not a mark of shame, but a badge of honor when she was one of the few prisoners to make it through the war alive. One highly memorable cousin showed us photos of his ornate tattoos and explained how he was jailed as a teenager for painting graffiti on New York subway trains. He is now a glowing superstar/ fine artist whose one-man shows of graffiti art appear in the finest galleries in Europe. 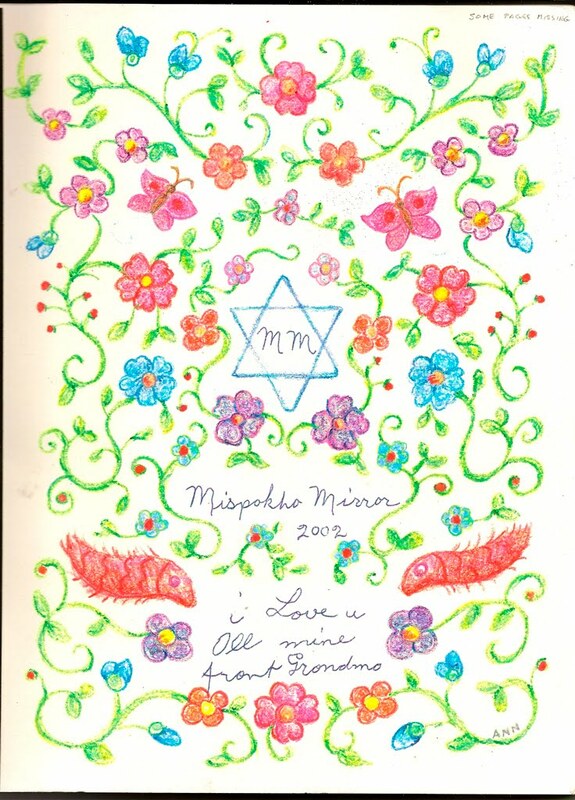 There are pages and pages of lavishly illustrated stories from small children, one 6-page cartoon series from a college student, photographs galore dating back to the 1800's, and plenty of poetry pages illustrated in crayon with Polish folk art by my own ancient grandmother. A renowned violin maker cousin told us the difference between an early and a late Stradivarius. Another wonderful story was laid out by a former WW II navigator who safely guided his pilots from Africa to a tiny airport in Brazil by flying across the Atlantic Ocean through three thunderstorms without a radio. They landed with only 6 minutes of fuel left. I've even compiled a number of very adventurous stories about my father’s own family. I used them to help write a book called Escaping to America: A True Story, which among other things explains how the family was almost captured by soldiers when they escaped from war-torn Poland in a hay wagon in 1921. Why am I telling you all of this? Because every family on the planet has stories just like ours, including you. Happy or sad, devastating or embarrassing, bizarre or hilarious or mundane, they’re the best stories you can ever imagine because they relate to you personally. (And please note that they are all nonfiction!) So I hereby propose on this week-after-Thanksgiving that each of you readers of every age take a firm grip on your next golden opportunity whilst you still can and write your family’s best stories down one at a time. Interview your older and younger relatives too by making them tell you everything you wanted to know but were afraid to ask. Raid ancient letters, funny emails, old photos, older drawings made by little kids, and even tacky souvenirs from some vacation spot and include them along with the rest. Be sure to add the dates! And remember that even stories from this week will work just as well. Have a blast and please let us know what you find. A couple of years ago I took a break from writing nonfiction children's books and spent several months editing them instead. I had been hired to fill in for my own editor while she was on maternity leave. This temporary dream job gave me the opportunity to work with--and learn from--some wonderful authors, including fellow Inklings Sue Macy, Deborah Heiligman, and Roz Schanzer. proved them wrong. In 1825, he celebrated the completion of the Eighth Wonder of the World. It was called the Erie Canal, and it changed America forever. This manmade waterway, 363 miles long...made travel easier, cheaper, and faster than ever before between the American East and West. It is hard for us to imagine that transportation on the canal at four miles per hour could be considered 'high speed,' but in the 1820s, that pace seemed very fast indeed. Two hundred years ago, the canal...was a miracle of technology." **Shameless bragging alert--feel free to skip to the next paragraph. 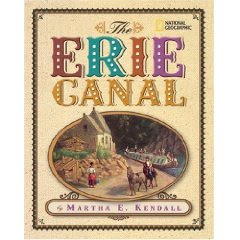 ** For those of you still with me, I'm delighted to report that The Erie Canal was one of two National Geographic titles among the four 2009 Jefferson Cup Award Honors bestowed by the Virginia Library Association. The other was my own Helen's Eyes: A Photobiography of Annie Sullivan. The second book I'm excited about sharing is Margaret Whitman Blair's Liberty or Death: The Surprising Story of Runaway Slaves Who Sided with the British During the American Revolution. 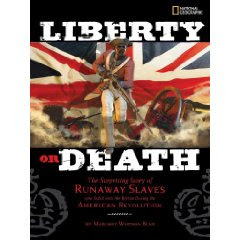 Scheduled for release in January 2010, Liberty or Death is the little-known story of the American Revolution as told from the perspectives of the African-American slaves who fought on the side of the British Royal Army in exchange for a promise of freedom. Blair notes in her epilogue, "It is often said that history is written by the winners. Americans won their rebellion against British rule--and are proud of recalling the struggle to become an independent nation. But what of the thousands of people who were brutally dragged from their homes and families in Africa to America? To the slaves, the Patriots' cries to live free from British tyranny must have rung hollow indeed." When I worked on this book it was still in the manuscript stage and it fascinated me. Now that I see it all grown up into a beautifully illustrated book, I find the important story it tells even more compelling. Blair deserves to be proud of this one. I know that I am. Last weekend, I was asked to speak at the Games in Education Forum, part of the Chicago Toy and Game Fair at Navy Pier. My presentation was called Play and Creativity in the Classroom. The air in the room and the showroom below was filled with fun, excitement, and energy, so, in a way, I felt like I was preaching to the choir. by Kathy Hirsh-Pasek Ph.D., Roberta Michnick Golinkoff Ph.D.
Peppered through the presentation were online and down-loadable lesson plans. Several other products were set up on other tables, but I was touched by the teacher who was so grateful for the plastic tangrams she could take back to her class. The cardboard shapes that she had created were worn and dog-eared and she had no resources to purchase new ones. My nine-year-old's fourth grade class is doing a nonfiction book unit. After checking out his school library and the local public library, he came home empty-handed from his search for a nonfiction book. Mind you, this child is the opposite of a reluctant reader so I was very surprised. After checking out my collection, he picked one of my favorite books. We've had a great time talking about the history behind some of the classic toys. In fact, I bought him some Silly Putty and that's the only toy he's played with for the last two weeks. Remember that this Black Friday, during the toy buying scramble --- Silly Putty = $1.99 and hours, days, weeks of fun! And, remember Toys and Games for the Classroom, too! 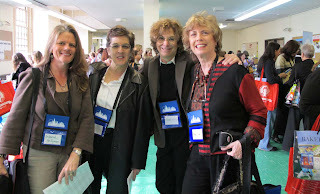 Last weekend I spoke at the 2009 California School Library Association Conference, with its theme of Embrace the Serendipity of Learning. I love librarians. One of them, speaking to a group of writers, said that we are their heroes. Well, the feeling is mutual. Especially these days. The conference exhibit hall was about as densely populated as our Mojave Desert, with vast walls of curtains trying to disguise the fact. Folks strolling the floor were likewise of a desert town density. Presentations were scheduled simultaneously and I held my breath to see if I would attract more than the one person who introduced me. I spoke on – what else for an INK blogger? – The Serendipity of Reading and Writing Nonfiction, and when I got a crowd of about twelve, I felt grateful indeed. The session I attended after mine had only four in the audience, but the speaker was just as enthusiastic and engaging as if he were addressing four hundred. Seriously though, the state of school libraries in California is abysmal and getting worse. As you probably know, the Golden State is no more. Now there’s only budget deficits and criminal cuts in services in them thar hills. So what does that mean for school libraries? California, once an innovative leader in public education, now stands 51st in the nation for school librarian ratios. That’s quite an achievement in a country with 50 states. Two years ago our ratio was 1 school librarian for 5,124 students. Yes, that’s 1:5174. Today it’s much much worse. At the conference I, of course, only met those librarians who still have jobs and the wherewithal to attend a conference. One librarian I met works at ten different elementary schools – half a day per week in each one. Three hours per school per week. Another works only three days a week and covers six schools. Her district won’t pay her mileage, so she spends a whole day at each school – twice a month. Acquisitions budgets have evaporated. Yet all were eeager to see my flyer on the INK Think Tank database. Some downsized librarians are classroom teachers now. One described her Catch-22. If she, as a teacher, provides the enrichment that she offered as a librarian, it will justify her district’s argument that they don’t need a school librarian after all. The San Diego Unified School District, one of the largest in the country, is considering closing all school libraries and using them as storage rooms. How dare we shortchange our children and their education like this -- impoverishing the programs at the elementary and secondary levels and ensuring that cash-strapped college students are left out of the top tier of our state university system? All in the service of no new taxes. Back at the conference it was heartening, as always, to surround oneself with people who love books, and understand that children’s authors do important work. And what is more fun than standing in front of the friendliest of audiences and talking about yourself and your books for an hour? But still, I couldn’t help but sense a ghostly presence in the nearly-empty exhibit hall and meeting rooms – the ghosts of all those librarians that should have been there. Camila Alire, President of the American Library Association, addressed us one evening and implored us to lobby for change. Not just by emailing our lawmakers, but by talking to our friends, our relatives, our neighbors, parents in the schools – to tell them what’s wrong and try to get them to care. Just let that kiss come soon. I spent the last two weeks observing and eventually participating in a middle school social studies classroom. I worried, well in advance of course, that I wouldn’t know what was going on. I knew that I had to teach my own lesson at the end and I already felt inadequately prepared and clearly lacking in the requisite knowledge base. I grumbled at the thought of reading chapters of the dry textbook just to catch up. Much to my surprise, there was no textbook in sight in the sixth grade social studies classroom. Mr. G. used videos, websites, handouts, and graphic organizers for his unit study on the Bill of Rights. The students got into small groups and each discussed a Supreme Court case which focused on a specific issue protected by the 4th or 5th amendment. Later in the week, students compared how their rights were different in school and out in the real world. Introduction of concept, comparisons, discussion—just as it should be. No one was asking for a textbook. Even though I was never a boy scout, I always like to feel prepared. So I thought about the best way to bone up on my rights. Luckily I remembered Kathleen Krull’s book, A Kid’s Guide to America’s Bill of Rights. Curfews, Censorship and the 100-pound Giant. I had read it before but I reread it again over dinner during the first week. Concise, funny, and packed full of information, it was exactly what I needed. So I couldn’t resist. I had to share. I brought the book in to show Mr. G and suggested it would be a great read for some of his students who wanted to know more. It turns out Mr. G. himself wanted to know more. He was enthusiastic and asked to borrow it; he said he’d read it during his free period. He taught the same class six times a day. I was skeptical that he’d really give up his free period to read more about the same topic. Indeed he did and he said he found some great stuff to incorporate into his lessons. My lesson turned out to be on the basic setup of a courtroom. Easy peasy for this law school graduate. No review required. But, still, if anyone knows a good book on the subject, I’d like to read it. Because once you try to explain something to someone else, you naturally want to learn more yourself. And then to pass it on. G’day from Down Under! I’m in Australia for a week’s worth of school visits starting tomorrow, and some extra time devoted exploring and research. I just saw my first kangaroo in the wild! Aside from marsupials, the Sydney Opera House, meat pies, didgeridoos and other pleasures of Oz, I’m thinking about the metric system, or Système Internationale (SI), as it is properly known. In my presentations at schools, I refer to measurements many times. Last week while presenting at the wonderful Springfield Ball Charter School in Springfield, IL, I asked my host to make a note every time I said something like, “Light travels 186,000 miles per second” or “I’m about 6 feet tall” or “If you ate ice cream at a rate of one ounce per minute…” I wanted to know all the times I use measuring units in the American way. I believe it makes perfect sense to say that the speed of light is 300,000 km per second and that the earth is 150,000 million kilometers from the Sun. (It’s pronounce KILO-meters, by the way — not kill-O-meters.) But should I convert when I am talking about my book on proportion, If You Hopped Like a Frog, and I say that I’m about six feet tall, and if I my tongue were as long proportionally as a chameleon’s (half as long as its body), my tongue would be three feet long? In other words, should I tell the Australian children that I am 183 cm tall, so my chameleon tongue would be about 91.5 cm? Or… to use the title example, in the States I tell my audience that a 4’6” child able to hop like a frog (meaning 20 times his or her length/height) would be able to jump 90 feet. Here in Australia, should I say that a 137 cm child able to perform a frog’s feat would thus hop 27.4 meters? Of course not. Exact conversion often makes for complicated, daunting mathematics. The best thing, I think, is not to convert, but to think metric from the start. Tomorrow, I won’t say I’m 183 cm tall. I’ll say I’m about 180 cm tall so my tongue (if I had one that was as long, proportionally, as a chameleon’s) would be 90 cm long. And so on. A month ago I was invited to a sixth grade class in St. Louis to talk about my biography of the artist Romare Bearden. 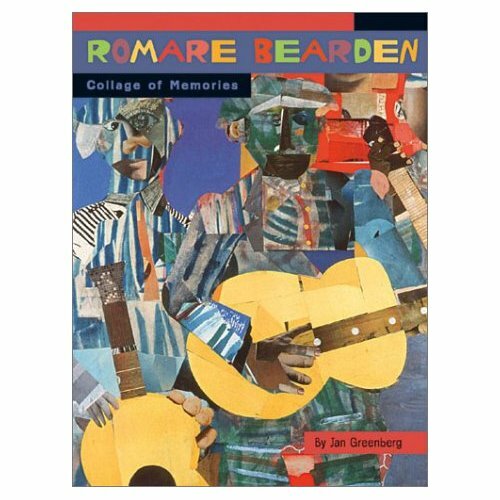 I hadn’t looked at this book for a couple of years and when I reread it, I was struck by the beautiful job the designer did of emphasizing the artist’s collages by using blocks of colorful backgrounds. Bearden, himself, actually began with blocks of color paper to make his innovative collages. 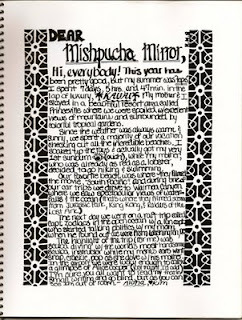 The design, which played off Bearden’s style, helped to unify and enhance word and image. Although I planned to show slides, I wanted to present the material to the students without recapping the whole book. 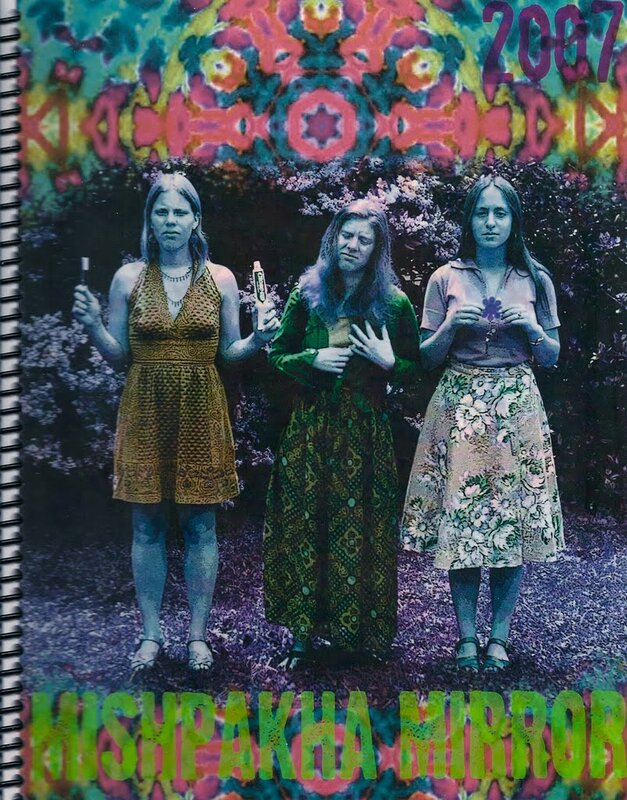 After all, the teacher had read it before my visit and there were several copies in the classroom. I decided it would be more fun to ask questions and draw them into a discussion right away. I began with a quote by Bearden. One student said his life was so boring, if he were a whale, he’d spit everything back. Another talked about swimming to school that day through waves of falling leaves. And so began a dialogue about using the common, everyday aspects of one’s life as material for art. Certainly some of Bearden’s most compelling collages portray his memories of childhood – family and friends going about the ordinary pleasures, as well as the difficulties, of their days. His work is a visual autobiography that traces his childhood in a small town in North Carolina, to his years in Pittsburg living with grandparents, to his adult life in Harlem and the Caribbean. Bearden’s artworks celebrate his African-American culture, which was especially relevant for this group of inner-city kids. In his collages, Bearden experimented with a variety of materials, from photographs, magazine images, newspaper, paint, fabric, foil, string, pins to colored paper and more. He drew and added color with pencil, charcoal, ink, oil, watercolor, acrylic, or spray paint. After he put down blocks of colored paper, he pasted layers on top, arranging and rearranging until he felt satisfied. Reminds me of revising my writing –arranging and rearranging until I get it right. A few weeks later the teacher invited me back to share the artwork the class created after my presentation. The walls were lined with collages by these young artists, who used family photographs, photos of buildings and scenes in their neighborhood, newspaper cuttings, construction and tissue paper, tin foil, magic markers, glue sticks and scissors. Under each of their collages, they had written first person accounts of the experience relating to the image. A creative teacher. A responsive group of students. I felt like the whale swimming through their world with my mouth wide open, taking it all in. Tomorrow morning, bright and early, I will hop on a plane bound for Philly to attend one of my favorite conferences of the year—NCTE (National Council for Teachers of English). There are many fun events on the schedule, from the ALAN Breakfast to the Children’s Luncheon and all things in between, but first up will be a panel presentation on making interdisciplinary connections for readers by pairing nonfiction with fiction, and vice versa. 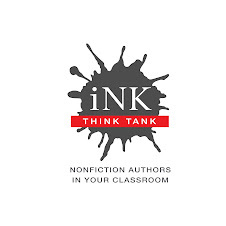 With Teri Lesesne presiding as moderator extraordinaire, four authors will discuss how to make the most of our books in the classroom. One of the exciting things for me as a reader is to lose myself in a time or place that is new to me. And the more connections I can make to that time or place—or topic—the more vivid my understanding becomes. Here’s a sneak preview of our panelist pairings. For the scientists among you, try having kids read Loree Griffin Burns’s Tracking Trash while exploring 20,000 Leagues Under the Sea (Jules Verne), Flush (Carl Hiaasen), and The Highest Tide (Jim Lynch) to help kids come to grips with conservation issues. To make broader connections between historical fiction and real life events, Jenny Moss pairs her historical fiction novel, Winnie’s War, with nonfiction titles such as The History of Everyday Life by Elaine Landau and Epidemic! The 1918 Influenza Pandemic by Stephanie True Peters. Kate Messner will share her new middle-grade novel, The Brilliant Fall of Gianna Z., which introduces readers to botany and the poetry of Robert Frost, as well as touches on themes of organization of time management and how that affects kids. Some of Kate’s pairings for The Brilliant Fall of Gianna Z. include Poetry for Young People: Robert Frost, Identifying Trees by Michael Williams, and The 7 Habits of Highly Effective Teens by Sean Covey. And in Almost Astronauts, the historical context of what life was like for women in the 50s and 60s grows ever more broad if we make literature pairings that deepen the ideas being introduced. So, if you have a reader who likes learning about women trying to be astronauts when they were not yet allowed, or is intrigued by themes of discrimination, or just wants to get their hands on more material about space and aviation, try also giving them novels like Flygirl by Sherri L. Smith, White Sands, Red Menace by Ellen Klages, Cosmic by Frank Cottrell Boyce, or Promise me the Moon by Joyce Annette Barnes. And if you’re in Philly tomorrow, please come by for unabridged version of our talk! Seven score and six years ago (if I've got the arithmetic right), the terminally worried and sleep-deprived 16th U.S. President had traveled on the clattering cars north from Washington, D. C. up to Gettysburg, Pennsylvania. Up until the previous summer, when all manner of evil racketing nightmare and nobility was visited upon the place over the course of three impossibly hot and dreadful days in July 1863, few people had ever heard of that sleepy little college town. More than three months later, the ground thereabouts was still spongy with all of the blood shed there. All these years later, Gettysburg, PA, is and will ever be the high-water mark of the Confederacy, the farthest Robt. E. Lee was ever to lead his raggedy Army of Virginia. A place known for suffering and roaming spectral spirits of young men ripped out of their lives before their natural times. And a place where Abraham Lincoln gave a little speech at the dedication for the new national cemetery. [Lame old joke: What's the Gettysburg Address? Where Abe Lincoln used to live.] Today's the anniversary of that grievous, auspicious ceremony on November 19, 1863. Energy is in the news these days, so perhaps some of us can share ideas about the changes we’re making as we try to live more sustainably as authors, illustrators, readers, and citizens of this planet. I’ve previously posted about whether paper or electronic books are the greenest. What about other practices, whether easy or a little more complex? I haven’t printed out a photograph in ages; send PDFs to editors so manuscripts or book dummies don’t have to be printed out; compile lists and reference material such as images on the computer. Recycle ink cartridges; use rechargable batteries; properly recycle or dispose of e-waste; combining errands; use recycled paper; reuse paper printed on only one side (great for running declog cycles on my printer! ); save oddball non-recyclable items such as plastic lids, scrap mat boards, and anything else usable as part of an art project to give to schools, Scout groups,etc. One thing to be happy about is that as a freelancer working at home for over two decades, I’ve avoided using a pretty large quantity of gasoline. Or buying a lot of dressy clothes and shoes... sweatpants last a long time! The Planet Green site has tips specifically for authors that address book production and other relevant topics. One interesting tidbit was the percentage of Americans who want to write a book... a survey came up with 81%, which would be about 250 million titles! The first book of mine on an environmental topic was The Great Trash Bash, which tells the story of a town with too much garbage and how they tackle the problem together. 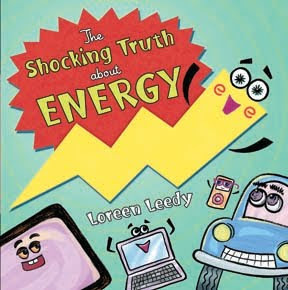 The Shocking Truth about Energy (available Spring 2010) addresses the pros and cons of various forms of energy from fossil fuels to wind, solar, geothermal, and plant-based. There are also two spreads of energy-saving tips for kids and parents such as banishing energy “vampires” (e.g. adaptors). But even books that aren’t primarily about an environmental topic may have room for some relevant connection. Have you seen ”green“ worked into a book in an agreeable way, or done so in your own writing? 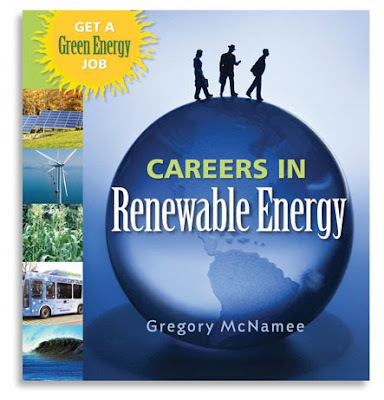 How about inspiring a young person to consider a green career? This should be a growth area for years to come unless we somehow have chlorophyll genes directly inserted. We had a solar water heater installed on our roof about a year ago and it works extremely well. Lists careers opportunities in energy, green building, and management as well as the education needed, schools with suitable programs, and web sites with job listings. If you have some ideas that don’t usually show up on the usual green tip lists, please share it with us. TIA! We authors write about what we're interested in and want to learn more about. We write to make a point or to share a passion. We write for ourselves, for the child inside of us. But that doesn't mean we don't have our audience in mind as we research and write our books. When I write a book, I write for the child inside me who is the age of my intended audience. I also always keep in mind the adults who will be reading my book to a young child, or handing my book to an older child or teenager. Writing is, after all, communication. And you want to make sure you are communicating in such a way that your reader will listen, absorb, learn, and perhaps even change. When Charles Darwin was working on his great book, The Origin of Species, whose 150th anniversary is next week, November 24, he had his audience in mind at all times--which made him hold off on publishing for decades. He knew that his theory of evolution by natural selection was going to rock the English religious boat, and he was not someone who wanted to rock any boats at all (least of all one he was on--prone to seasickness as he was). But he had an idea he believed in and wanted to share. So he did two things when he wrote the book: He worked very hard to make his argument airtight. And he wrote it in a tone that would not offend. Because not only did he have his audience in mind at all times, he had the perfect representative of a good part of his audience right there on the sofa next to him. His wife Emma. Emma Wedgwood Darwin was extremely intelligent and well-read, and she was also religious. She was just the reader who might have trouble going down the path with Charles. He knew that if he could make his argument airtight enough, Emma (and the audience she represented) just might be able to set aside her reservations about the religious implications. And if he wrote his book the way he spoke--respectfully and politely, with his audience's feelings in mind--perhaps he would not offend. If you look at The Origin of Species I think you will see what I mean. It is a beautifully-written book, well-argued, polite, and intimate in a way. You feel as if he's talking to you. He even has a chapter called "Difficulties with the Theory" stemming from Emma's questions after reading an early draft. "A great assumption!" she wrote in the margins next to his description of the development of the eye. I wrote CHARLES AND EMMA for the tween/teen that I was, and still am inside. Back when I was just realizing there was a world outside of my small one, I wanted desperately to read about people and their life stories. I felt sure I could find answers in this way. I was obsessed with the big questions of religion and death and love and meaning. I still am. I believe most children of a certain age are also. And I think many adults as well. Like Charles, I also did not want to offend; but I wanted to tell the truth. I hope I struck that balance. When I write my books for younger kids, like HONEYBEES, for example, I write for my younger self, or for that third grade boy in the second row in my assembly who needs me to grab his attention. The one who will perk up when he hears how a honeybee passes the nectar she has gathered to the bee who will store it in the beehive. She regurgitates it into the other bee's mouth! Boy did I have my audience in mind when I shrieked upon reading that fact. O.K., I thought it was exceedingly cool and gross (in a good way), too. This week many of us have been writing about the questions kids ask. Maybe you are tired of the subject, but frankly, I can’t help myself. To add a little variety, I’ll change up and talk about some of the letters and emails I’ve received from students. I am working on a research paper and in my thesis statement I have to identify you. Would you be considered a 19th century author? Please let me know ASAP. Okay, on to me. I love the thank you notes that teachers assign after I’ve made a school visit. Certainly my mother would have approved. 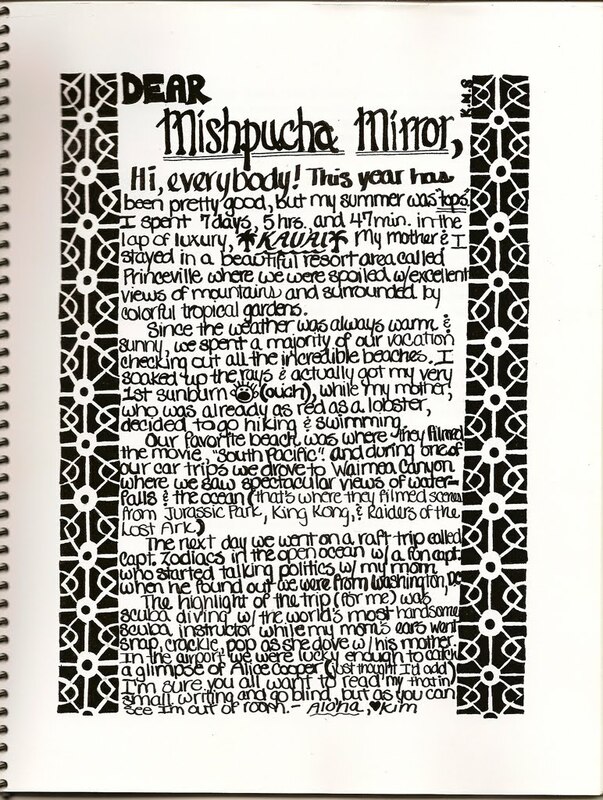 Here’s an excerpt from one letter that came from a school where I talked about Ultimate Field Trip 1: Adventures in the Amazon Rain Forest, illustrated by my frequent collaborator, photographer Michael J. Doolittle. Dear Susan Goodman, I’m one of the many people who were in your second grade group. Here’s one question I wanted to ask you: Is your photographer Michel Dolittle related to Dr. Dolittle? Here’s another note that asked a question (name changed, mistakes included). I couldn’t resist. I had a book going to press and my husband ended up sharing his dedication, although I did invoke poetic license and changed her suggested wording. Last one for this post, although I keep going. One Sunday evening, I happened to be online and received a desperate email from a young lady with an assignment due the next morning. She asked me if my underlying reason for writing Ultimate Field Trip 4: A Week in the 1800s was…and then gave me two alternatives. I immediately wrote back saying that neither answer was right and then explained the message I was hoping to convey with the book. Moments later I got another email, this time from her mother. She explained that her daughter was filling out a multiple-choice assignment created by the textbook company that had excerpted my book. And she provided me with all four possible explanations for my motivation. I studied them and decided the answer was E, none of the above. I wrote back and suggested her daughter bring this email chain between her and the author who explained her real intent to class. Who knows, maybe she’d get extra credit for taking some initiative. HA! A week later I received an email from the mother who thought I might be interested in the upshot. Her daughter didn’t get any credit for the question, the answer was B. As a lover of irony, I suppose this email exchange should be my favorite. But it’s just so wrong on so many levels. We can talk about: A) the issue of textbooks in general (although I’m grateful that this one used my writing as a good example). We can talk about: B) making children limit or reduce their interpretations of what they read to previously digested categories (which may well be wrong). We can talk about: C) the fact that assignments should help kids learn to think on their own rather than letting others tell them what they think (perhaps wrongly). We can talk about: D) not rewarding initiative and imagination. Which do you think wins the “most wrong” award—A, B, C, or D? Give me your answer. But don’t forget that there’s always E, none of the above. My husband and I are getting ready to move to Portland, OR. We’ve been in the same home in California for 10 years, and for all that time, I’ve worked in the same space: my little office. The space will be different, but it will still be quiet, with an empty table for my stacks of notes and a bookcase for my references. I’ll put my favorite things up on the walls—a goofy picture of my family, a perfect Dilbert cartoon, posters of my books, and artwork that my daughter has produced over the years, dating back to her Kindergarten attempt at a ladybug, when all the dots ended up on one side. I will make this new space into my space. I know many authors who take their laptop or their pad of paper and venture out into the world, to write in coffee shops, library corners, and park benches. I’ve never been like that. I may scribble notes here, there, and everywhere, but I write in my office. For me, the sense of place helps me shift gears, quiet myself, and focus. It helps me tap back into where I left off, the day before. I’ve been thinking a lot about writing space ever since I began work on The Extraordinary Mark Twain (According to Susy.) For much of the year, Mark wrote in his home in Hartford, CT. But in the summers, the family went to visit his wife’s sister on her farm in Elmira, New York. And there, every morning after breakfast, he took a winding path up twenty stone steps to a special, octagonal study built just for him. Mark had his octagonal study. I’ll have my quiet space filled with my favorite things. This blog is about two books: one a picture book (fictional) and one a photojournalism essay (nonfiction). Philip Caputo’s book 10,000 Days of Thunder: A History of the Vietnam War (2005, Atheneum) is, to me, a standard in nonfiction writing for children, and a gold standard in writing for children about war. Caputo served as a marine lieutenant in the Vietnam War. Later, in 1973, he shared a Pulitzer Prize as a reporter for the Chicago Tribune. His 1977 memoir of his service, A Rumor of War, is considered a classic in adult literature. And Maurice Sendak’s book Where the Wild Things Are is – I’ll just tell you what I really think – the top of the top, best ever. There’s even a movie out now. (Have you heard?) The book – like all Sendak’s books – are infused with shadows from the Nazis and their war. In just 124 pages, Caputo answers the questions underlying ever key word or phrase you might think of in association with Vietnam. Through short chapters and strong, dramatic, thoughfully-chosen photographs Caputo covers events such as the Tonkin Gulf Incidents and the Tet Offensive, describes the role of settings such as the Ho Chi Minh Trail and The Tunnel War, delves into personal issues through such chapters as “The Nurses’ War” and “Prisoners of War,” demystifies talking points such as Agent Orange and the Pentagon Papers, and brings readers up to date by explaining the continuing focus on those Missing in Action (MIA). He pays a visit to the Vietnam Veterans Memorial, and goes back to Vietnam to talk about what it’s like there today. I was four in 1964, the year Where the Wild Things Are was published. In that year the U.S. was sending troops to Vietnam. My dad (deaf in one ear) didn’t go. He had served in the army, was on duty in Germany Berlin Wall was raised, and when JFK was assasinated. By the time I was 13, I was babysitting for kids whose father had come home with shrapnel in his legs. I read them Where the Wild Things Are, which, for a work of fiction, sure felt true. I also inhaled 10,000 Days of Thunder, and wish it had been around when I was younger. Reading it, I realized that, for me, living through this war – hearing the daily casualty count, reading the headlines, watching the news – placed a focus on details that blurred the major stories. Caputo’s book brought me back visually to the on-the-ground dramas between soldiers and villagers, auditorially to the choppers and the radio songs (There’s a chapter called “We Gotta Get Outta This Place”—Music of the Vietnam War), and viscerally to the stories – so many stories, enough to make you proud of our servicemen, to make you grateful for their sacrifices, and to break your heart a thousand times. Through his structure, Caputo is able to control his material, to mete it out in details no more bearable for being brief, without melodrama or politics. His presentation shows an enormous respect for today’s kids, who are themselves living through two wars. Knowing the way a publishing schedule works, I think it’s highly likely that some of the kids who were middle schoolers – this book’s audience – while Caputo was writing it – may well be heading out to Iraq or Afghanistan. Daily media reports on the realities of war can hardly escape the notice of the most sheltered children. But, like the reports I heard as a child during the Vietnam war, this coverage is built on an adult framework of experience and understanding. I hope kids have someone they can rely on to translate, even if they can only pose their questions in the indirect way that I did, when I woke from a dream that green-uniformed soldiers had surrounded our house. And I hope that they walk into libraries and see 10,000 Days of Thunder on display. I bet it will get picked up, taken out, and read from cover to cover. I bet parents will notice it and take a look. And I believe that this important nonfiction book will help everybody understand – with respect, and without obfuscation – what war is really like. 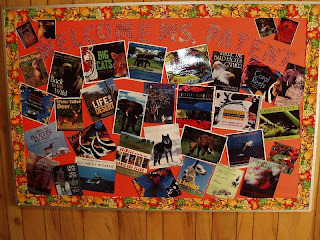 Sue Macy's post of 11/6/09, My Favorite Students, prompted me to think about some of the more surprising questions I've been asked during school visits--questions that had very little to do with the subjects of my books. 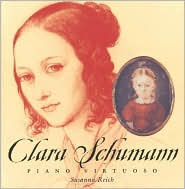 I was once speaking to a class of fourth graders about Clara Schumann: Piano Virtuoso, my biography of the 19th-century pianist and composer. Now granted, Clara's life was full of tragedy. Her husband, composer Robert Schumann, died when she was only thirty-seven, leaving her to support and raise their seven children. And several of those children pre-deceased her. But while these events are included in the book, the real focus is on the inspiring story of how music sustained Clara in the face of life's challenges. When I talk to kids about Clara Schumann, they're usually interested in her relationship with her father (who was also her piano teacher and manager), and in her achievements as a child prodigy. Still, I suppose I shouldn't have been so surprised when one student peppered me with questions about death. "What did Robert die of?" "How did Clara die?" "How come so many of their children died?" Clara's death was unremarkable--she passed away at the ripe old age (for the time) of seventy-six, following a series of strokes. But Robert suffered from bipolar illness and died of syphilis after spending the last two years of his life in a mental hospital. I hadn't come prepared to explain manic depression and venereal disease to fourth-graders, much less how those illnesses were understood and treated in the 19th century. But neither did I feel I should sidestep the questions. So I did the only thing I could do--I improvised, based on the knowledge I had, sharing information in a simple, straightforward way and on a level that I thought nine-year-olds could understand. Which is, after all, what I strive to do when I write my books. The student seemed satisfied with my answers, and I later found out from the teacher that there had been a recent death in that student's family. Another surprising--and much less serious--question came during a school visit for José! Born to Dance, my picture-book biography of the Mexican-American modern dancer and choreographer, José Limón. After leading a group of K-2 students through a dance/movement experience, sharing a slide show about my life as a dancer and writer, and holding up manuscripts in different phases of revising, editing, and production, I invited questions. "Did you ever have a dirt bike?" a boy asked. "No," I said, grinning. "But I bet dirt bikes are really fun." At that, the boy beamed. It didn't matter to either of us that the question wasn't about José or dancing or books. A child had made a personal connection with an author. And isn't that why we visit schools in the first place? Every two years, a group of dedicated teachers and librarians, some retired, bring about 20 authors to the Eureka, California, area to join some local authors in The Author Festival, when we make presentions to area schools and offer books for sale at the library. On one day I visited Trinity Valley School, out in the countryside, a place that doesn't get that many outside visitors. The children created this poster to welcome me. It's always great for children to meet "real" authors; it gives them a deeper appreciation of books and sends them right to the library shelves. Those of us who participate always enjoy the various events, but one especially rewarding aspect of our days there is the time we have to connect with one another. Some people call writing a lonely profession; I prefer to say we are alone when we write, not lonely. In either case, many of us have little opportunity for contact with other authors. We may belong to critique groups, which can provide regular interaction with a very limited group of colleagues. Events like the Author Festival give us a chance not only to catch up on personal lives but also to learn of possibilities for our own careers--publishers that are still bullish on nonfiction books, for example, or a new way of connecting with our readers. This year, I learned that the practice of video presentations by way of skyping and iChat is already being utilized by some authors instead of physical school visits involving energy-inefficient airplane travel, costly hotel stays, and so forth. Living in my own 'shell' in Montana, I didn't realize that this distant-learning kind of work that our INKTHINKTANK company is jumping into already has its pioneers. This realization only increased my excitement about what we're launching, creating an "everybody wins" situation among authors, schools, librarians, and teachers. We’ve been focusing on how our books are used in the classroom on I.N.K. this month, so I thought I’d pay tribute to some of the more memorable students I’ve met in my role as an author over the years. I’ve given them nicknames to ensure their anonymity, but I can picture each of them to this day. Remembering their innocence, their curiosity, their disarming comments keeps me humble and reminds me why I love writing for young audiences. 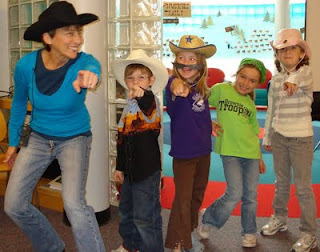 The Straight Shooter: When talking about Bull’s-Eye, my biography of Annie Oakley, to third graders at a suburban New Jersey public school, I met a girl who confidently stood up and asked, “Since rifles have a greater range than shotguns, why did Annie Oakley use shotguns in her performances?” Mind you, I hadn’t told the class that rifles shoot farther—she just knew that. In third grade! I asked how she had come upon that particular fact and she answered that she’d learned it from her brother. Hmmm. By the way, the reason Annie used shotguns when she performed in outdoor arenas with Buffalo Bill’s Wild West show is that she didn’t want any shots that missed her targets to travel beyond the arena and hurt people or damage property. Plus the collection of pellets from one shot of her shotgun had a greater chance of hitting the target than the single bullet emitted at the pull of a rifle's trigger. The Doubter: During an author Q&A at a middle school in Iowa, I explained that I had written my book, Winning Ways: A Photohistory of Women in Sports because I love sports. A boy in the class looked me up and down, incredulous, and finally asked, “But aren’t you too old to like sports?” I was 43 at the time. The Dedicated Swimmers: As part of the events surrounding my presentations on women’s sports history at a private girls’ school in New Jersey, the elementary students were invited to dress in the equipment of their favorite sport. Kids had a great time wearing soccer uniforms, softball cleats, and basketball jerseys, but the ones who I remember best were those swimmers who walked around in impossibly tight bathing caps all day long. Ouch! The Intrepid Historian: Finally, there is the sixth grader from Los Angeles who chose the All-American Girls Professional Baseball League as the topic for her National History Day presentation. It’s a popular History Day choice; the experiences of the women who played baseball during and after World War II seem to resonate with kids, especially girls. But this enthusiastic teenager and I shared a six-month correspondence as she worked on her project. After an initial telephone interview, during which she asked me some basic questions about the league, she updated me on her progress via e-mail and occasional phone calls just about every week. Not surprisingly, she won $50 and a bronze medal for “having the most phone and email interviews out of 750 students!” In her last e-mail, on March 16, 2009, she wrote, “Thank you very much Sue Macy. You have no clue how much you have helped us win.” I kind of miss her. I’ve been out of the office a lot lately, so I haven’t been writing much. But I’ve still been reading. Reading really is an important part of writing—just as important as sitting down at the keyboard and typing away. Since I write nonfiction books, I read a lot during the research phase of any project. I read kids books and adult books on the topic. I read magazine articles and scientific journals too. This reading provides me with background information, which I can then round out by interviewing scientists working in the field or with my own experiences. But I also read children's nonfiction to learn from the masters. I love the way April Pulley Sayre and Dianna Hutts Aston craft language. I love how Steve Jenkins and David M. Schwartz play with format and design. I’m a huge fan of the voice that runs through Vicki Cobb’s books. She really knows how to make science fun. And I’m in awe of how Deborah Heiligman synthesizes information is new and exciting ways. I also read fiction written for kids and adults. I read poetry too. As I read fiction, I pay close attention to how the writers pull readers into their story, how they build scenes and develop narrative arcs, how they use language to create mood, and how they achieve the kind of pacing their stories need. All of these elements of craft can enrich nonfiction writing too. Sometimes I discover clever new techniques that I can modify for my own purposes. Sometimes I come away with a solution to a problem I’m having with a particular manuscript. And sometimes I’m just plain old inspired. That’s important too because writing can be hard work, and sometimes I just need a reason to keep on going. When I write, I treat my brain like a computer. I give it instructions, tell it what I have to write about, put in information about the topic, and give it plenty of time. Much to my delight, sooner or later my brain comes through with an angle or slant, a way into a topic. Since I want to write about what happened today, my brain hasn’t had much time to process the angle part. So I’m writing this off the cuff. The classroom we presented in was standing-room only and we did get a conversation going with our attendees. One woman said that she was the only teacher in her school to teach nonfiction. Another said that there was very little communication between the library and the classroom. Still another told me that teachers are so pressured with paperwork and teaching to the tests that they have no time to take advantage of the resources available in the library. We asked, “How can we help to bridge this abyss?” We’ve got a few ideas but we need to get a dialogue started. Any suggestions from you, out there in cyberspace, are welcome. Technology is changing our world. We want to teach our students to have productive “habits of mind.” For all of us, teachers, authors, parents, librarians, there is no way to keep up with the changes unless you learn new skills. We authors ARE life-long learners. We can bring our hard-won knowledge and ability to show how we got there to the digital age. We're doing it now on this blog. Fasten your seatbelts, everyone. Prepare for an exhilarating ride! The Best Stories of all Time. Really! Somehow October’s chorus about using our books in the classroom didn’t come everyone's way on the guitar until November, so kindly bear with me for a minute while I wrap up my part of this song with one last verse. I hated history when I was a kid. The way we were supposed to learn everything was by memorizing a bunch of boring names and dates and battle sites. To me, the people in history were a lot like George Washington on the dollar bill; old and green and wrinkled and dead. What a waste! The real George Washington wasn’t anything like that portrait. Just between you and me, our boy George was a stud. He was so tall that most other men only came up to his shoulder. He was a great athlete and his hands and feet were enormous—what a basketball player he might have made! This terrific horseman, dancer, and card player was also so fearless in battle that even when his horses were shot out from under him and bullets ripped through his coat, he never left the front lines. You can’t make this stuff up; it’s all true, and if I had known things like that about the dead people in my history books, well of course I’d have wanted to hear more. So how can teachers make history spring to life for kids? Here are three of the ways. 2) Tie-Ins- If you can get kids to relate directly to something in a book about history, you’ve got it made. Here are some examples from my book talks—no reason why with a little extra imagination teachers can’t do this kind of thing too. In one school, the students put on a wonderful play about Lewis and Clark based on my book How We Crossed the West and invited me to watch. When I visited their classrooms the next day, I surprised each actor and actress by telling them some incredibly happy and sad and funny things that happened to their own characters after the journey ended. This new information was a huge hit. When I presented the same book another time, we were able to bring a real Newfoundland dog (like Seaman, the one Meriwether Lewis brought on the journey) into the room. Bingo! I got to tell about all the funny and even life-saving adventures the dog had on the trip. Trust me—dogs are attention grabbers all the way. And during a previous Presidential election, an older group did a great job of comparing the gigantic role propaganda played in promoting George Washington vs. King George III back in Revolutionary times with the role propaganda played in that particular presidential election. 3) Lights, camera, action!- Younger audiences like nothing better than to sing, laugh, make funny noises, and wear costumes. As it turns out, these qualities are great tools for teaching history too. I love to use my book The Old Chisholm Trail; A Cowboy Song as a fun intro to those famously difficult cattle drives from the wild west. Very Short Version of how this works: I dress up as a cowboy and briefly explain how hard that trip must have been. Then I invite 3 volunteer cowboys onstage, where they don huge paper moustaches, and I give 3 more volunteers stuffed longhorn cattle to hold. As I (badly) sing funny verses from the real song, the cowboys and cows make appropriate cowboy and cow sound effects when I point to them after each verse, and the audience sings the chorus in their turn. It is hilarious, it’s the BEST teaching tool, and it all comes from a book. Try it! Barbara Kerley's book, What To Do About Alice?, won the 2009 Washington State/Scandiuzzi Children's Book Award in the picture book category. The book is illustrated by Edwin Fotheringham, a Seattle resident. Gretchen Woelfle will speak on Reading and Writing nonfiction: A Study in Serendipity at the California School Library Association Conference in Ontario, CA on Friday November 20. She will also sign books at the Author and Illustrator Brunch on Sunday, November 22. From Deborah Heiligman: CHARLES AND EMMA: THE DARWINS' LEAP OF FAITH is a Finalist for the National Book Award. Award ceremony is Novemer 18 when the winner will be announced. But I am thrilled to have my book be a finalist. Helen's Eyes: A Photobiography of Annie Sullivan, Helen Keller's Teacher by Marfé Ferguson Delano was named a 2009 Jefferson Cup Honor Book. Presented by the Virginia Library Association, the Jefferson Cup is an award that honors biographies, historical fiction, and American history books for children. Sue Macy will be signing copies of her new book, Bylines: A Photobiography of Nellie Bly, on Friday, November 6, at the American Association of School Librarians (AASL) conference in Charlotte. Stop by the National Geographic booth from 3:30 to 4:30 to pick up a book and say hi. And don't forget to mention you heard about it on I.N.K.! From Jan Greenberg: Christo and Jeanne-Claude Through The Gates and Beyond is on Booklist's Top Art Books of 2009 list. I will be at NCTE on November 20 in Philadelphia signing Side by Side at Abrams booth 1:30-2:15pm and attending the Notables awards for Language Arts session at 2:30. Hope to meet some of you there.